Planning to spend your weekend by watching Ittefaq in the cinema near you? Read detailed Ittefaq movie review by BollywoodMDB before booking your ticket. Vikram Sethi (Sidharth Malhotra) is a renowned UK based author who visits India to launch his upcoming book. But before his novel could hit stands, his wife Katherine (Kimberley Louisa McBeath) is found dead. Vikram calls the cops but instead of finding the culprit, they arrest him as the prime suspect. Fearing that his whole life would become a hell if he goes behind bars for a crime he has not committed, he flees from the scene and accidentally barges into a complete stranger Maya’s (Sonakshi Sinha) home. In an unexpected turn of events, Maya’s husband is also found dead in the apartment. Maya accuses Vikram of murdering her husband and police books him in a double murder case. Soon, Inspector Dev (Akshaye Khanna) takes the case in his hands and begins his investigation. Vikram and Maya both are suspects and both present different narratives about the events that happened that fateful night and accuse each other of the murder, making his almost impossible for Dev to find the truth. Will Dev ever be able to catch the real cuprite? Who is lying about that eventful night, Vikram or Maya? To know, you can watch the film in the cinema near you. Released without absolutely any promotions, Ittefaq is a very important film for both of its protagonists– Sidharth Malhotra and Sonakshi Sinha. Both have not given a clean successful movie of late and hence what turn their respective career will take depends on the performance of this film. So, do they deliver this time? Yes, they do. Sidharth Malhotra in the role of a writer, who is the prime suspect in a double murder case, looks absolutely fit. He expresses his character not just with dialogues but his body language also. His performance is very restrained and subtle, something which makes you feel for his character. Sonakshi, on the other hand, also delivers a brilliant performance. She plays the character of Maya gracefully and looks very much in synch with her part. Though her screen time is comparably lesser than that of Sidharth, she manages to hold your attention with her balanced performance. But the man who steals all the limelight with his impeccable performance is Akshaye Khanna. While watching him play the character of Dev, a thought might cross your mind that he is getting better with age. He earlier impressed us with his subtle performance in Mom and now in Ittefaq also. Overall, all actors live up to the expectations. How do you hold audiences’ attention if you have shot your whole film only on one or two locations? Learn it from Abhay Chopra. He weaves his story and characters so engrossingly that you don’t care about where the film has been canned. Whether you like Ittefaq or not is a different story, you will still have your eyes wide open from start to finish. It is a thoughtfully and skilfully made film anchored by the amazing performances of all actors. Ittefaq contains so many layers that you would want to watch it more than once to understand its layered storyline. We all know that the film is an official adaptation of Rajesh Khanna and Nanda’s 1969 film of the same name, but Chopra has introduced many new twists and turns to keep you hooked throughout. Ittefaq is every bit intriguing and fascinating. After a long time has come a film which scores well almost in all departments. 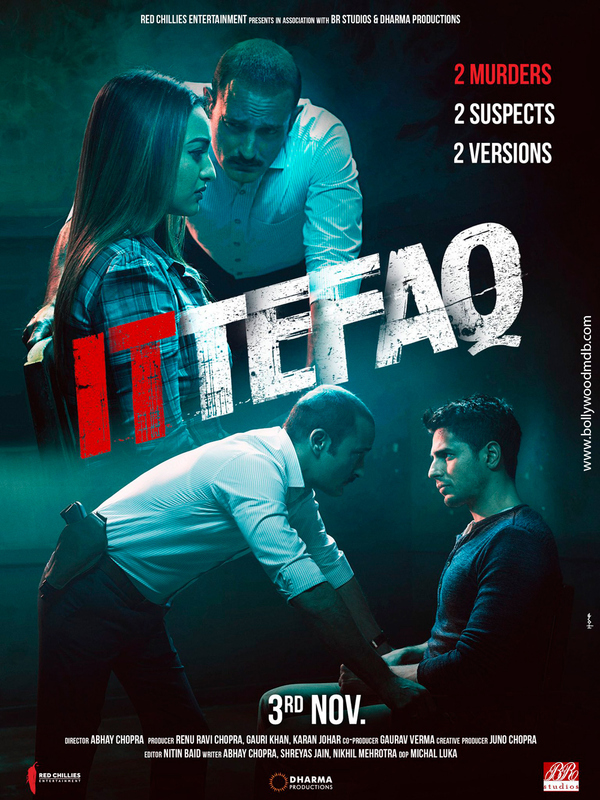 Ittefaq is a well-shot film cinematographed by Michal Luka with an excellent background score enhancing its visual appeal manifold. Maintaining an unhurried yet taut pace is always a prerequisite for a compelling whodunit film and Editors Nitin Baid and Sangeeth Varghese don’t disappoint there. They succeed in giving the movie its required pace and tightness. The production value of the film is quite rich. Though the album of Ittefaq includes 8 tracks, none of the songs is shown in the movie. You will have to enjoy them separately. Of all the songs in the album, you can easily get hooked to the promotional song 'Ittefaq Se', which is a reprised version of veteran music composer Bappi Lahiri’s superhit track, 'Raat Baaki' from the film Namak Halaal (1982). While the original song was sung by Asha Bhosle along with the composer, the rebooted version has the voice of Jubin Nautiyal. A couple of new lines have been added to it to give it a modern feel. Other songs are just okay. Ittefaq is one of the best suspense-thriller films you would have seen in a while. Missing it is not advisable at all. Powered by an engrossing and sharply focused story, taut screenplay and riveting performances, Ittefaq is a total paisa-vasool film. DON’T miss it.